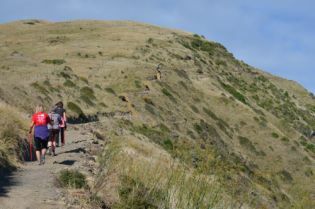 Nordic walkers from the Kapiti area recently walked a new section of the Te Araroa walking trail. This “Escarpment Section” will eventually connect Paekakariki to Pukerua Bay. The walking track provides a physical as well as mental challenge. The first 2 kms is gentle and undulating, reaching a height of 50 metres before the “serious” part of the walk begins. A notice at the beginning of the track advises people who suffer from vertigo should not attempt it. Sections of the walk confirmed that! Zigzagging up the hillside, the track is a combination of a steep narrow path and even steeper steps! In 1.3 kms, the walker goes from an elevation of 4 metres to an elevation of 218 metres. It was a warm clear day with a gentle southerly, which provided a refreshing cool breeze. Walking with Nordic Walking poles shared the load between the arms and legs and helped with balance, making the journey easier. The lungs had a good workout as well! The panoramic views from the lookout were amazing, providing photo opportunities and a welcome refreshment stop. The return journey provided a different perspective of the climb. We could see the mountain falling away from the track to the railway line some 200 metres below. As we negotiated the steps, they looked even steeper, with some having 90 degree turns. One was conscious that if a step was missed or a stumble took place, you might have a bouncy trip to the bottom of the mountain! In summary, this track was most enjoyable. Everyone finished the walk breathless but exhilarated knowing that this trail is a precursor to what will be a great walk. Now, when are we doing this walk again!